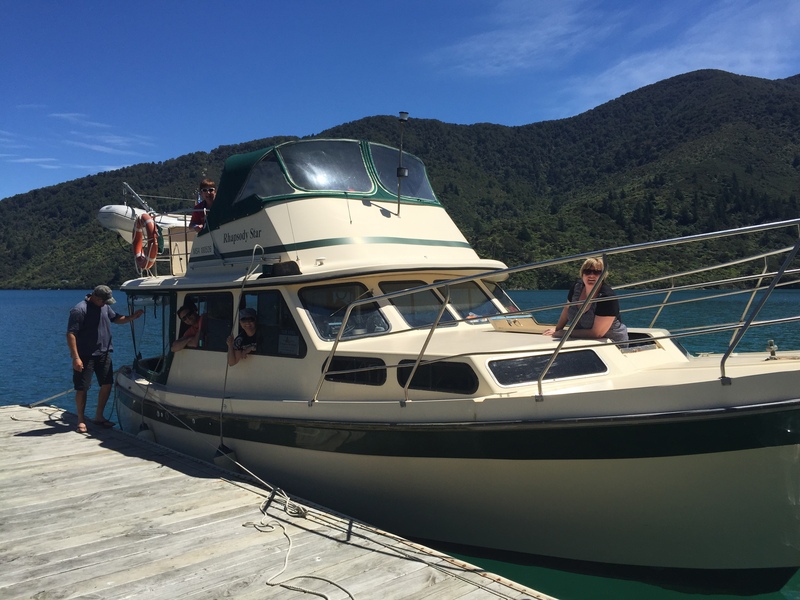 We have just had a fabulous weekend away in the beautiful Marlborough Sounds with some great friends on our annual dive trip. For the last five years we have chartered a launch called Rhapsody Star. She is a big tub – the design is called a Cuddles 35. She sleeps eight people and putts along at about 6 kts and uses very little fuel. She is cheap to hire for the weekend, and while she rolls terribly if you get side on to the swell, we all love her anyway! We arrived on the Thursday night of a long weekend, and it was too dark to head out of the marina in search of a mooring, so we stayed the night in there first and then got up really early and started heading out for some exploring. The forecast was for the weather to deteriorate overnight, so we decided to head out as far as we could on the first day and then come back in to the Sounds to find a good spot to shelter from the wind. We found a nice sheltered spot in the lee of Cape Jackson and the boys jumped in to have a look around. There are very strict fishing regulations in the Sounds, and our favourite Blue Cod is not allowed to be caught at the moment. So instead of dropping a fishing line over the side they went spear fishing instead, and came back with a couple of good size butterfish and a crayfish which we fried up to have in sandwiches for lunch. Our next stop was a small bay back towards Endeavour Inlet. Vic, Andrew and I dived in to see if there were any scallops. We hunted high and low, but there were no scallops in the bay. I did see a flounder. Around by the rocks there was lots of lovely coloured kelp and many fish were swimming around. The sun was shining through the crystal clear water. Vic & Andrew carried on spearing fish, and I explored the reef and swam back to the boat. Our next meal was some paua, or abalone. You aren’t allowed to catch paua with dive tanks, and you aren’t even allowed to have it on the boat or in a car with dive tanks anywhere around. So the boys free dived to catch a few paua and we went to the beach to cook them up for a little entree on a bonfire. The curious weka birds came down to the beach to check us out. We spent the night in Tawa Bay. There was a yacht already on the Charterlink mooring, but as they weren’t a Charterlink boat we kindly asked them to move along, and we were tucked away for the night, and ate a delicious butterfish curry for dinner. The next morning the wind was absolutely howling around the bay. The forecast was for 50kt Northerly and we thought we would have been nicely protected on the Northern side of the bay, but the wind was curling around and big williwaws were lifting the tops off the waves as the gusts blew through. We had breakfast and went back to bed or read magazines for a couple of hours, until the wind died away completely and we headed to Furneaux Lodge to have a cup of coffee and fill the tanks. We then motored back down the Sound, and dropped the boys off to look for some scallops on the way to Cockle Cove. A friend of ours has a mooring there, so we picked that up and the scallop finding mission was successful. 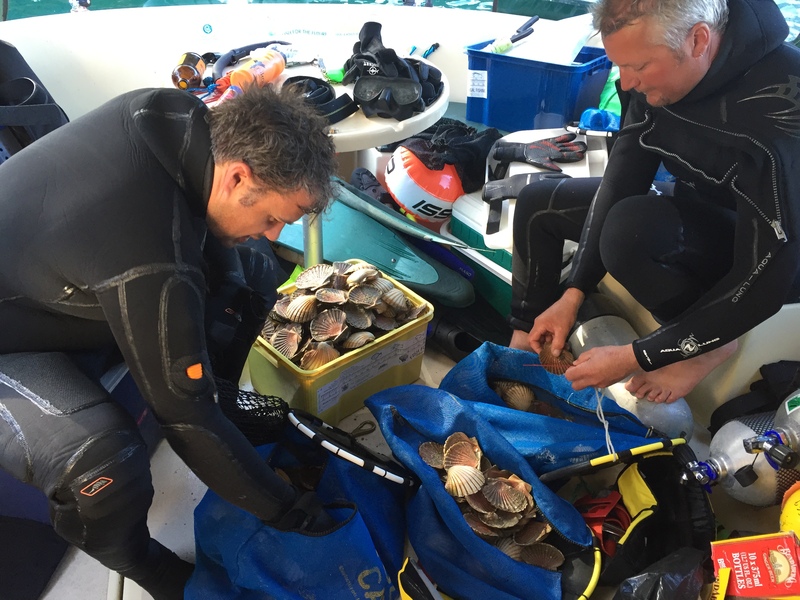 You are allowed 50 scallops per diver, only during the scallop season, and they have to be a minimum of 90ml wide. We check them when we pick them up from the bottom, and again when they come on to the boat. Any small ones are put back in the sea. If you are caught with more than your limit or undersize then the penalties are strict and can also involve taking your boat and car. By only taking what we eat we ensure that the fishery is sustained for the benefit of everyone. If you are unsure of the fishing regulations you can send a text to 9889 with the name of the fish and they text you straight back with the size and daily limit that you are allowed for your area – handy! My boss also has a house in the bay, and he had lost his mooring, so the next day we went out to see if we could find it. I’d had trouble getting under the water on my first dive, so I put some extra weight in my weight belt. However I also borrowed a friends steel tank. I didn’t do a buoyancy check when I went in the water and I had no trouble getting down this time. We were swimming around looking everywhere for the mooring, and as I was running low on air I decided to head back up – but had to kick really hard to get back up! I felt too heavy and even considered dropping my weight belt at one stage. You have to be very careful not to swim up to the surface too quickly or you can get the bends, or over inflate your lungs, by this stage I was feeling really puffed and a bit stressed out about whether I was going to make it to the surface! But I eventually made it and Andrew came to pick me up. The highlight of the trip was then going paddle boarding with some baby seals which were sunning themselves on the point of Cockle Cove. 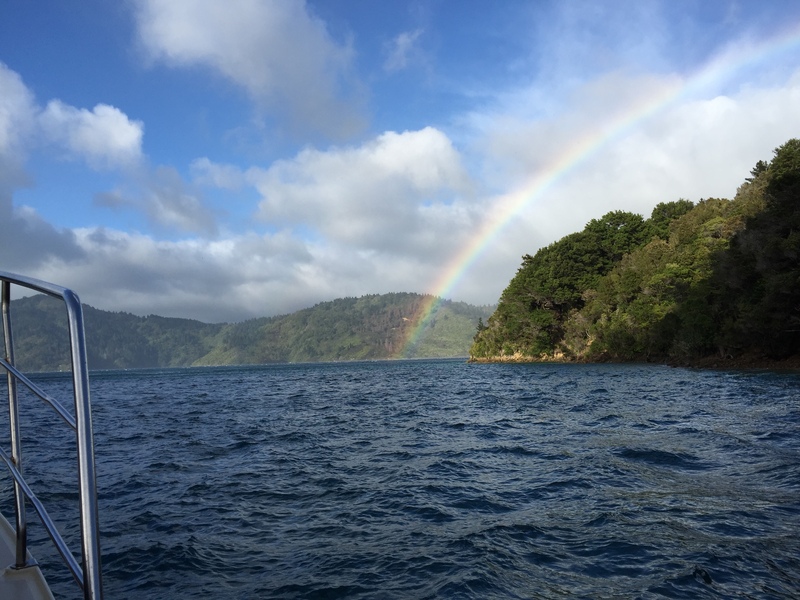 Here is a clip of the stunning Marlborough Sounds scenery and our baby fur seal paddle boarding adventures! Great fun seeing the seals playing around the paddle boards! Are you using a GoPro? We just got one too specifically for underwater shots, but are yet to try it. Will see how we go with it in the forthcoming voyage! Great! They are really cool, but do take a bit of getting used to. It took me a while to get the hang of the editing software, but once I had read the (very long) manual at the same time as doing the editing – I am kind of getting my head round it now. Although I am sure that there are hundreds of different things that it can do that I am not aware of! I would recommend having a good play with it, taking different shots and using the different mounts and waterproof cases etc, and then get used to using the editing software before you head away. That way you will be an expert once you get going and it is easier to look up tutorials online and print out manuals etc when you are at home than it is when you are out at sea! Also don’t leave it too long before you plug it in and download the clips to do the editing. It is a mammoth job if you leave it for too long. Also delete the clips off the GoPro once you are happy with your editing, otherwise the next time you plug it in, it will want to download everything again and it is hard to remember what you have/haven’t already done. Great read, Viki. There can’t be many better ways to spend a long weekend than in Marborough Sound . . . especially when scallops are involved! Your crawfish look like what we call lobster here in the U.S. Are they the same thing? That one is huge! Good eating! Yes I think they are very similar! They are delicious! Interesting to read about the fishing regulations—they must do a good job of keeping the stocks healthy if you’re able to dine so well 🙂 I think crayfish is what Americans call rock lobster rather than Maine lobster—they taste a little different but are equally delicious! It is good to hear that at least one government is doing something positive to protect the sea life and have appropriate penalties. The trouble with me is that I am literally the worst fisherman in the world as I cannot kill anything or eat something that looks like a fish. I do love eating fish but it has not got to look like it was once swimming.. I know, I am a total wimp. The video of the seals is amazing as they are just showing off. I was expecting one to come around the corner on its own paddle board. What the hell is a “Williwaws” ..
As usual a fantastic blog Vicky. Yes the fishing rules here are very strict, and we like to just catch what we can eat. I am like you though, can’t have anything much to do with the killing bit, but happy to get in the water, collect and eat! I loved the seals too! At one stage I thought they were going to jump on my board, and then one swam past with its mouth open – they have got very sharp looking teeth, I had visions of it biting my inflatable SUP and me disappearing like a rapidly deflating balloon never to be seen again! A williwaw – perhaps I have spelt it incorrectly… is like a mini wet tornado! Thanks for reading and commenting! Cant wait to see the next edition of your fishing adventure!